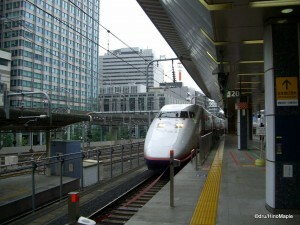 Heading north, rather than south, provides a very different experience using the Shinkansen. Unlike the Tokaido/Sanyo/Kyushu Shinkansen, the lines heading north share a main trunk and branch off at various points. 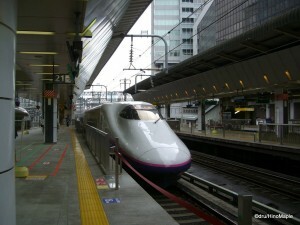 There are three main lines, and two “mini-shinkansen” that start from Tokyo Station. The longest line is the Tohoku line. This line started at the same time as the Joetsu line, but the Tohoku line will become more important in the near future. The Tohoku line currently runs from Tokyo all the way to Hachinohe. By the end of 2010, this service will be extended to Aomori, which is the larger than Hachinohe. Ultimately, the line will be extended further from Aomori to Hakodate, and then Sapporo. Unfortunately, Hakodate won’t be open until 2015, projected, and Sapporo may not open until 2020. It will be a long time, but when finished, it will cut the time from roughly 12 hours, to just under 4 hours for the most direct services. This will severely affect air travel as it currently takes 3 hours for most people to reach Sapporo from Tokyo. The Tohoku line is also connected to the Yamagata and Akita Shinkansen lines. These services are slightly different compared to regular Shinkansen. These lines use special trains that are narrower, and run at grade with various level crossings. They are usually coupled with regular Tohoku trains, but branch out at their respective start points. For this reason, it’s very important to know which train you are boarding. It’s very easy to be on the wrong train from Tokyo Station, but the signs are usually clearly marked, and train staffs usually check tickets while the train is between stations. The Joetsu Shinkansen is far simpler as there is only one line with no connections. The complex part is that it shares the tracks with the Tohoku Shinkansen from Tokyo to Omiya. This is due to costs. It’s very easy to see trains along the Tokyo portion of the line due to the volume of trains passing. Recently, it has also become popular for hotels to create “train” suites. These are rooms with views of the train tracks. 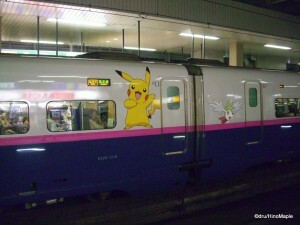 This is popular for “te-chans”, slang for train spotters in Japan. You could also make it derogatory by saying “densha-otaku”, but that’s a different story. It has also proved popular for young families with boys who love trains. What better way to “take a trip” and not spend too much money. As always, kids love boxes more than the toys that are inside them. The Joetsu Shinkansen itself was built to service Niigata, but it also serves a small ski resort called Gala-Yuzawa. A relatively less used, yet equally important Shinkansen line is the Nagano line. This was built in time for the Nagano Olympics. Currently, it shares over half of its line with both the Tohoku and Joetsu Shinkansen lines. There are relatively few trains that travel this section due to the limited service range. It basically follows the Joetsu route from Tokyo to Takasaki, where it branches off on its own to Nagano. There is a planned extension from Nagano to Kanazawa by 2015. By this time, the line should be renamed to the Hokuriku Shinkansen, further extensions to Tsuruga Station has been planned and will be built. The line will ultimately link up with Osaka someday in the future. The main purpose of this line is to connect the major cities on the Sea of Japan side of Japan to the main cities of Japan. Whether it will prove popular or profitable will remain to be seen. All three main lines utilize the same trains, while the Yamagata and Akita Shinkansen use their own specialized trains, for reasons mentioned above. The trains have a similar styling to the southern route trains. They used to use similar naming methods as their southern route cousins, but now they use the prefix E before their designation. Due to this naming convention, you can still ride the 200 series train, which is very similar to the 0 and 100 mentioned in my previous post. 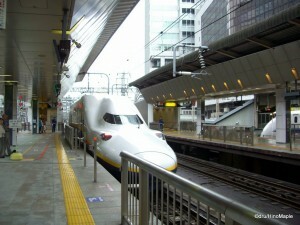 The first “modern” train you can travel on is the E1, a wedge nosed, bi-level, Shinkansen. In 1997, the E2, E3, and E4 were introduced. The E2 is similar to a duck billed train, but it isn’t as strongly pronounced. It’s also one of only two trains that have been exported, the other being the 700 series. The E2 was exported to China for use on their high speed railway. The E4 is a bi-level train, like the E1, but with a duck bill nose. The E3 looks like most European high speed trains, but used only for the Yamagata and Akita lines. By 2011, there will be a new rain, the E5 entering service. This is expected to take the system into Sapporo when that line opens. It will be the fastest train in the entire Shinkansen fleet. The final impression of this fleet is that it’s great! Coming from Canada where high speed rail is non-existent, this would go a long way to connecting any country. Countries such as China have begun their own high speed networks. President Obama has also pledged to start thinking, and possibly building it soon. If done right, it can earn money and save a lot of fuel. Connecting Vancouver to San Diego is a viable option, so is Toronto to Miami. While we must never forget how we get the electricity to power trains, it’s still probably cleaner overall compared to planes. Can they replace planes completely? Conventionally, they cannot replace planes at the moment. We’ll have to wait for maglev trains before that could happen, but even then we are limited to specific ranges. 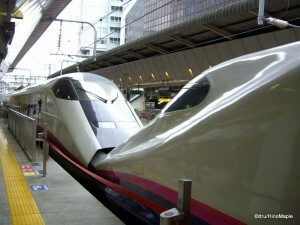 If you do travel to Japan, do try to use the Shinkansen. It’s a fun, if expensive, way to travel. Be sure to buy a JR Pass if you are only visiting. It’s worth the cost if you head from Tokyo to Kyoto, even for just a day. This is the second part of two in the Shinkansen series. To read more, continue to the Shinkansen – South Routes. This entry was posted in Hokkaido, Kanto, Tohoku, Trains and tagged 0 series, 100 series, 200 series, 700 series, Akita, Akita Line, Akita Shinkansen, Aomori, bi-level train, bullet train, canada, China, densha-otaku, duck bill, e1, e1 series, e2, e2 series, e3, e3 series, e4, e4 series, e5, e5 series, Gala-Yuzawa, Hachinohe, Hakodate, Hokkaido, Hokkaido Line, Hokkaido Shinkansen, Hokkuriku Line, Hokkuriku Shinkansen, japan, Japan Railways, Japan Railways East, Joetsu Line, Joetsu Shinkansen, JR, JR East, JR Hokkaido, JR Pass, Kanazawa, Kyushu line, Kyushu Shinkansen, Miami, mini-shinkansen, Nagano, Nagano Line, Nagano Olympics, Nagano Shinkansen, Niigata, olympics, Omiya, San Diego, Sanyo Line, Sanyo Shinkansen, Sapporo, Sea of Japan, Shinkansen, Takasaki, te-chan, Tohoku, Tohoku Line, Tohoku Shinkansen, Tokaido Line, Tokaido Shinkansen, tokyo, Tokyo Station, Tokyo-to, Toronto, train, train spotter, train spotting, Tsuruga Station, vancouver, Yamagata, Yamagata Line, Yamagata Shinkansen, カナダ, 上越線, 中国, 九州線, 八戸, 函館, 北海道, 北陸, 北陸線, 山形, 山形線, 山陽, 山陽線, 新幹線, 日本, 札幌, 札幌線, 東京, 東北, 東北線, 東海道, 東海道線, 秋田, 秋田線, 金沢, 長野, 長野線, 電車, 青森 by Dru. Bookmark the permalink.